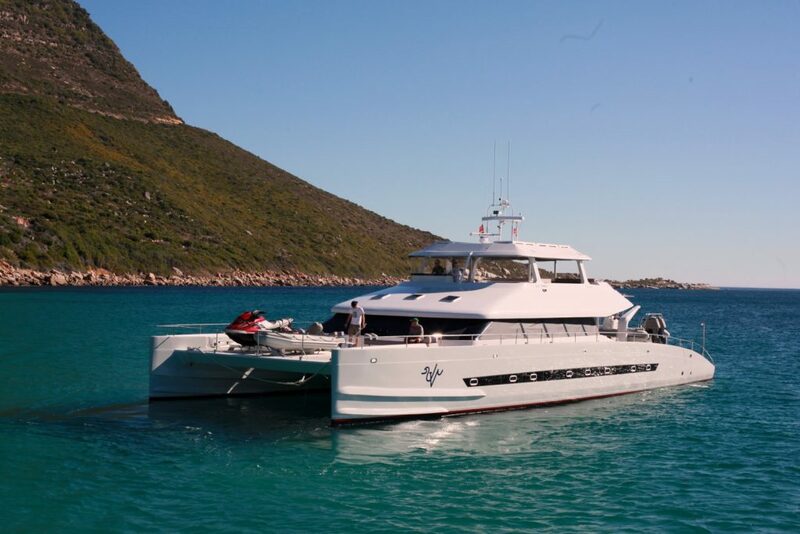 Du Toit Yacht Design has recently launched the Open Ocean 800 Luxury Expedition Catamaran. 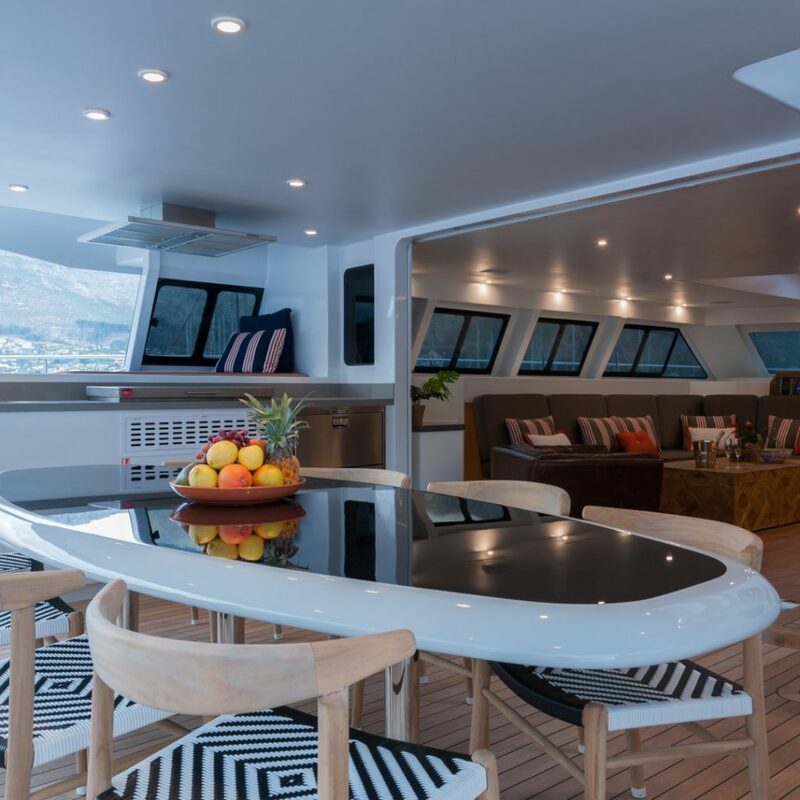 This impressive catamaran is expertly built by Two Oceans Marine Manufacturing and designed by Du Toit Yacht Design, both of Cape Town, South Africa. 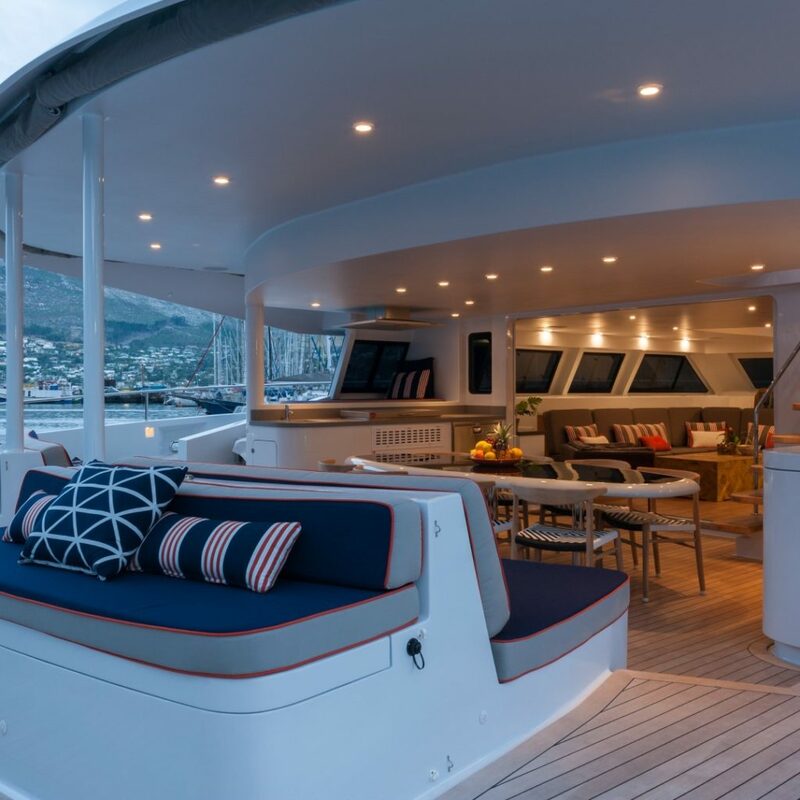 The Du Toit Yacht Design team and Two Oceans Marine Manufacturing are renowned as industry leaders and specialists in building custom designed, luxury catamarans with a build quality and attention to detail that is exemplary. 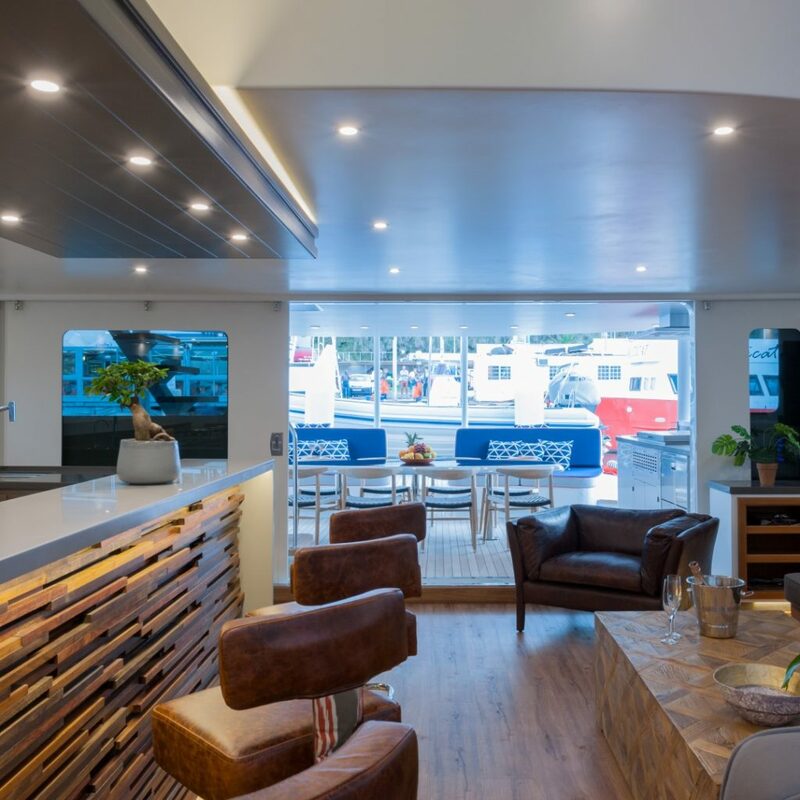 Ultra Vires, the Open Ocean 800 Expedition Catamaran, is the largest of the cats in Two Ocean Marine’s Open Ocean series and the largest power catamaran ever to be launched in South Africa. 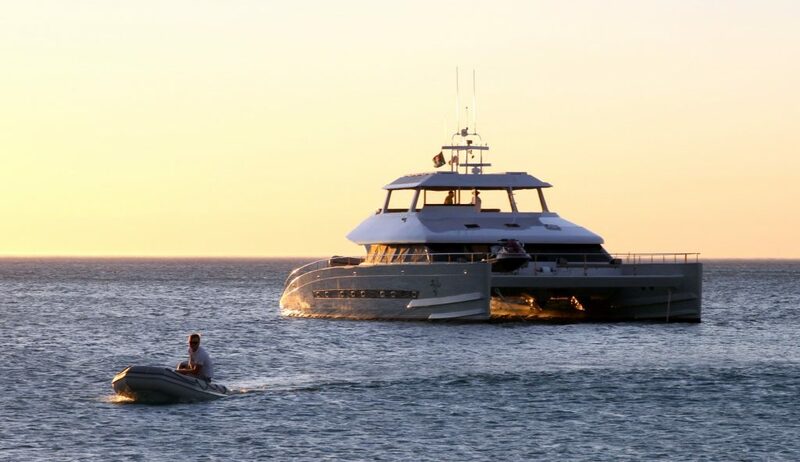 Powered by two Cummins 228 kW/305 HP motors, she is robustly build for transatlantic voyages and is capable of motoring long distances economically; independently or towing another 50 foot boat . 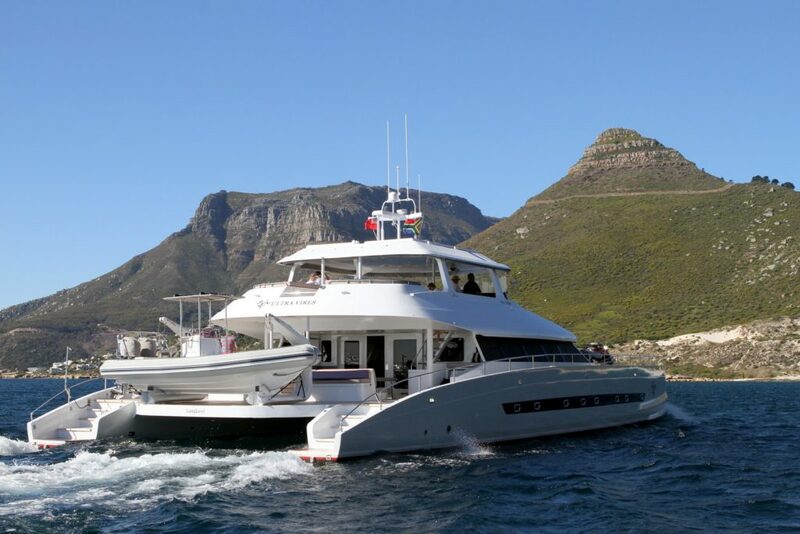 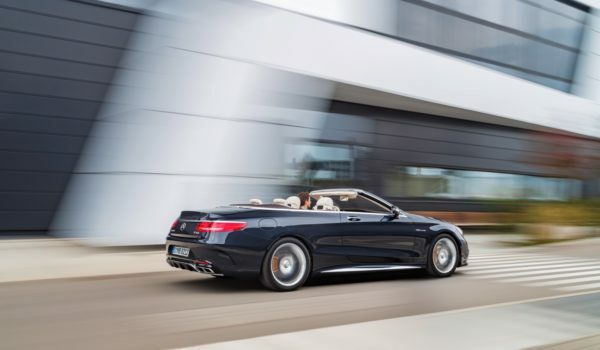 She is built to cross oceans effortlessly and with speed, and to have a motoring range of around 4,500 nautical miles. 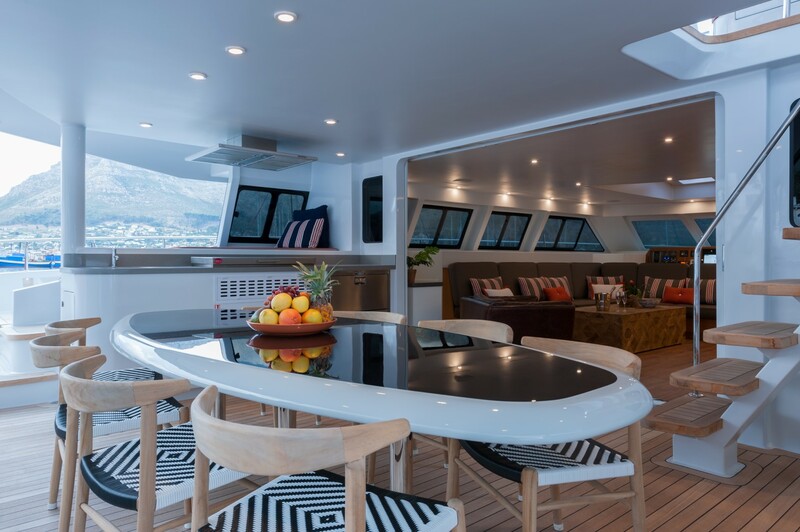 Design on this impressive catamaran took many months, with four designers involved at various stages in drawing up the design for the interiors, lines, structure and mechanical details, in consultation with the owner and builder, Two Oceans Marine Manufacturing, at all stages of the project. 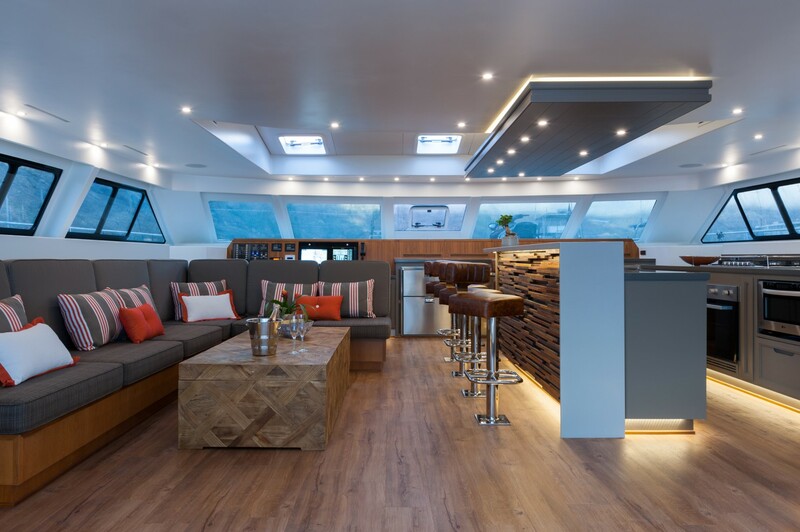 The Open Ocean 800 E was designed as an on-the-water home for a kite boarding and surfing family to chase the perfect kite boarding and surfing conditions. 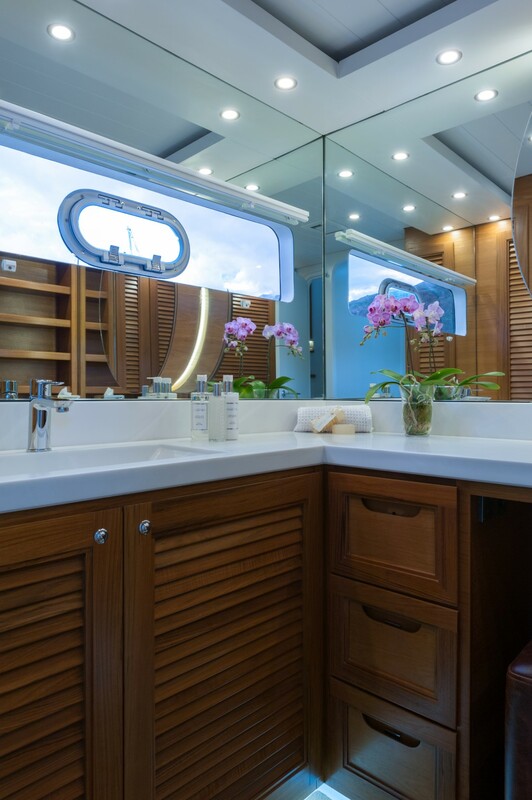 Ultra Vires has ample storage space for kites, kite boards and surf boards. 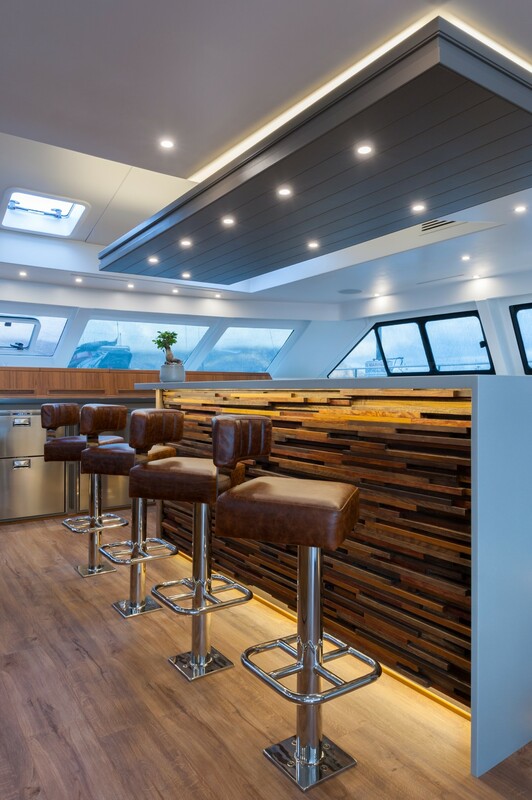 Ultra Vires is expertly built in a sandwich construction, using epoxy E-glass with a PVC foam core. 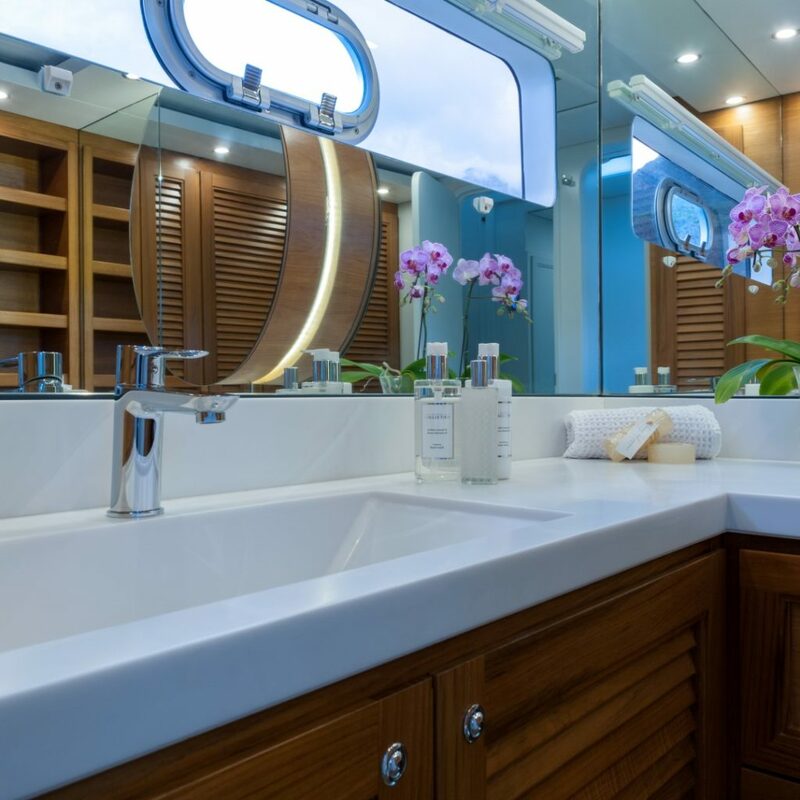 She is an elegant yacht with beautiful lines and intricate features. 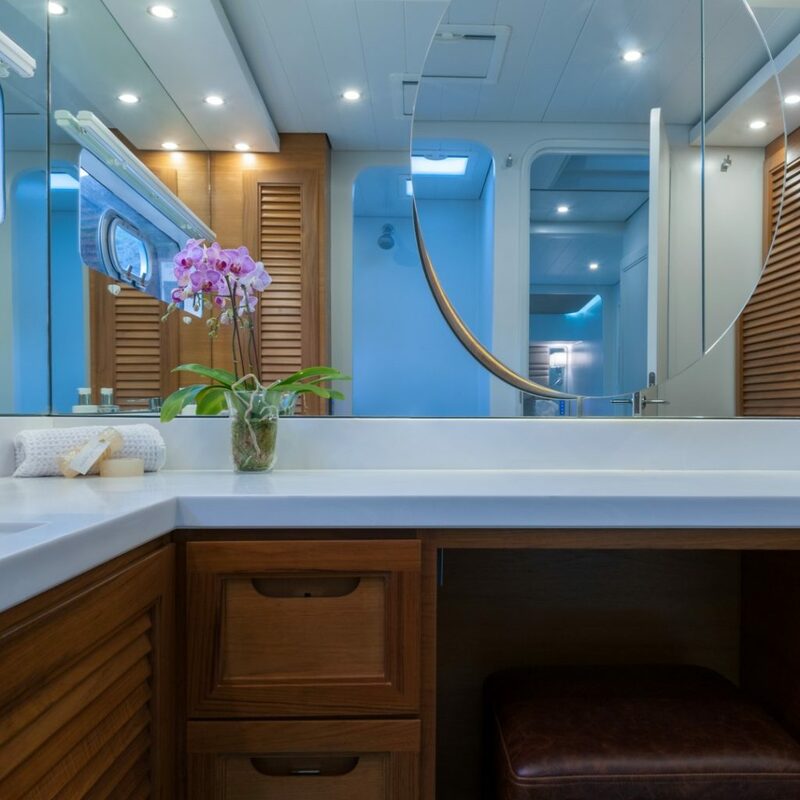 The interiors have been designed for effortless ocean living as the easily accessible spaces are open and free-flowing. 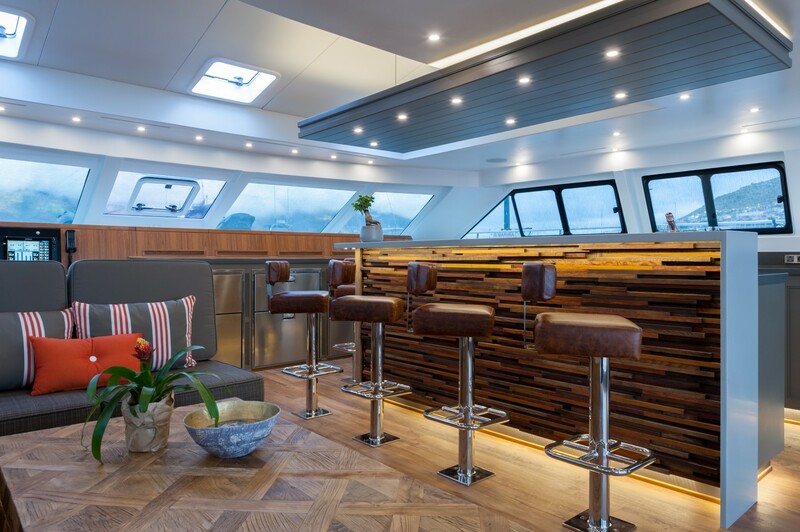 Ultra Vires’ interior is predominantly wood and monochrome. 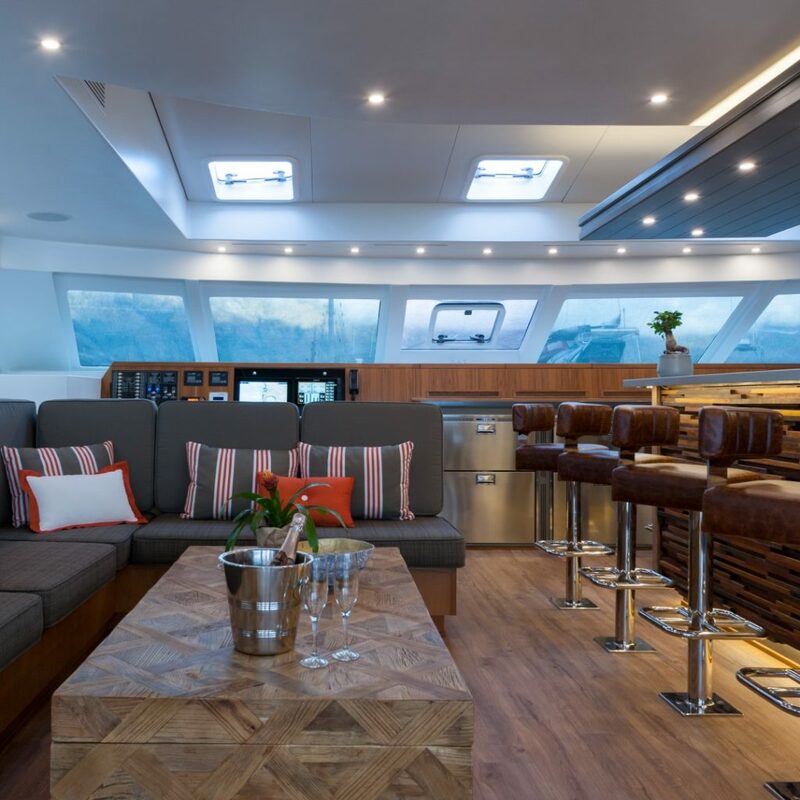 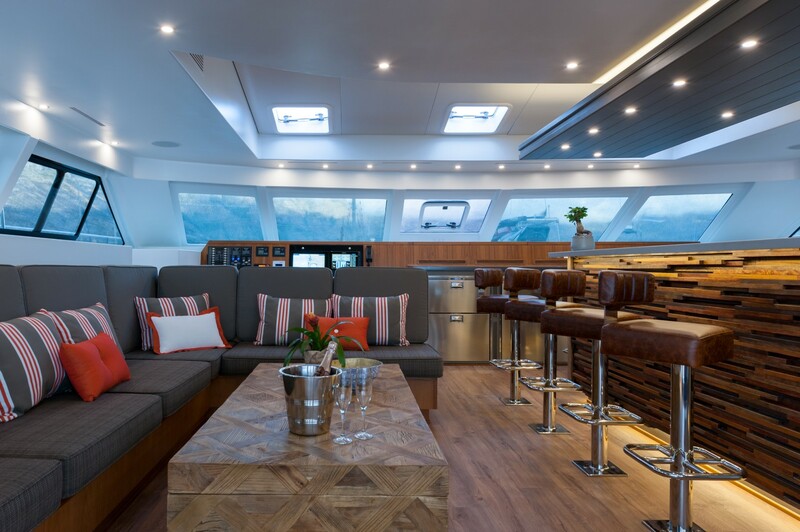 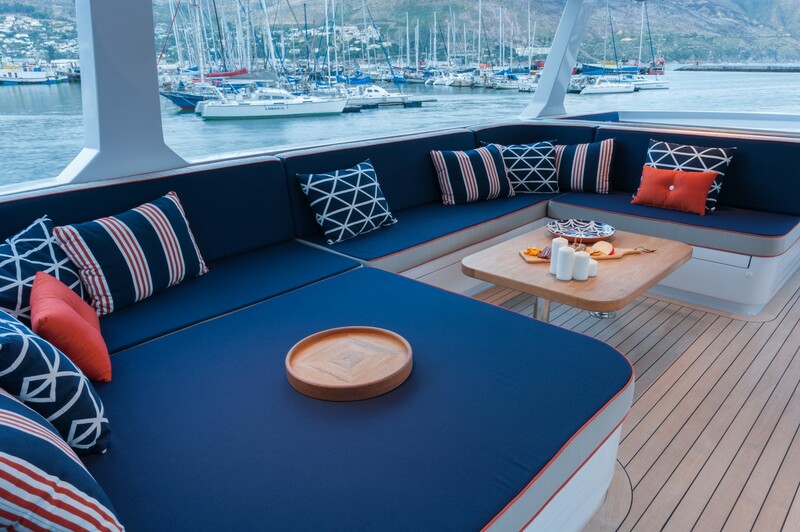 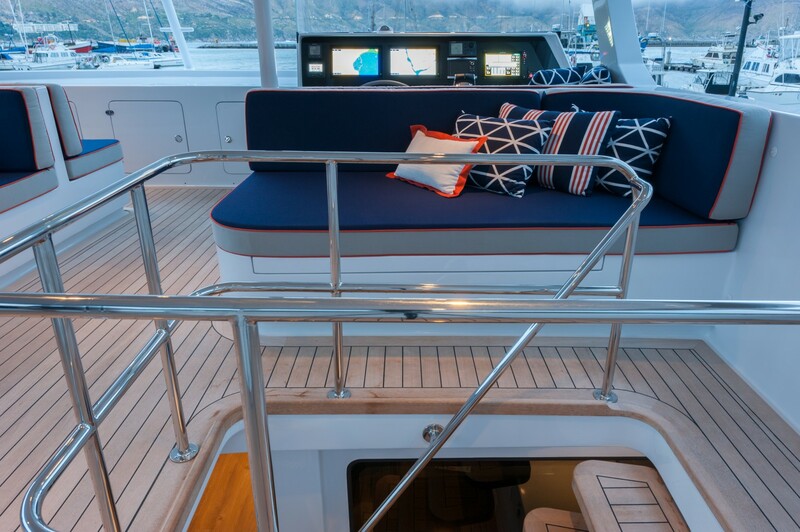 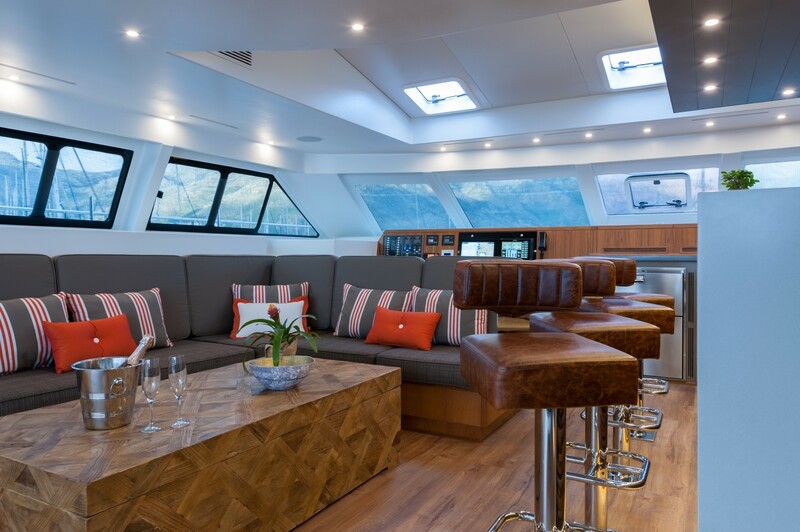 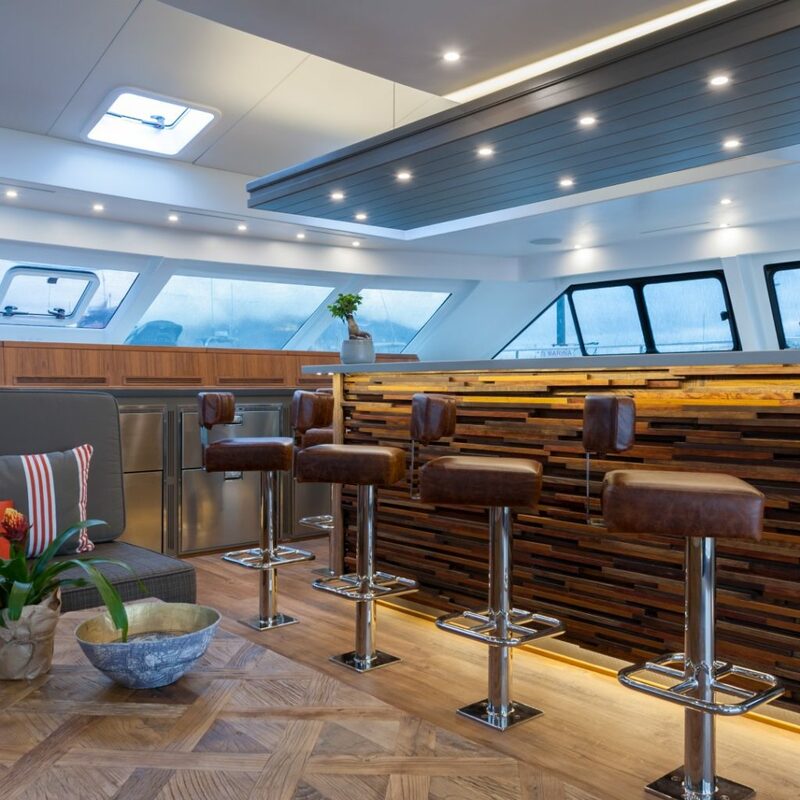 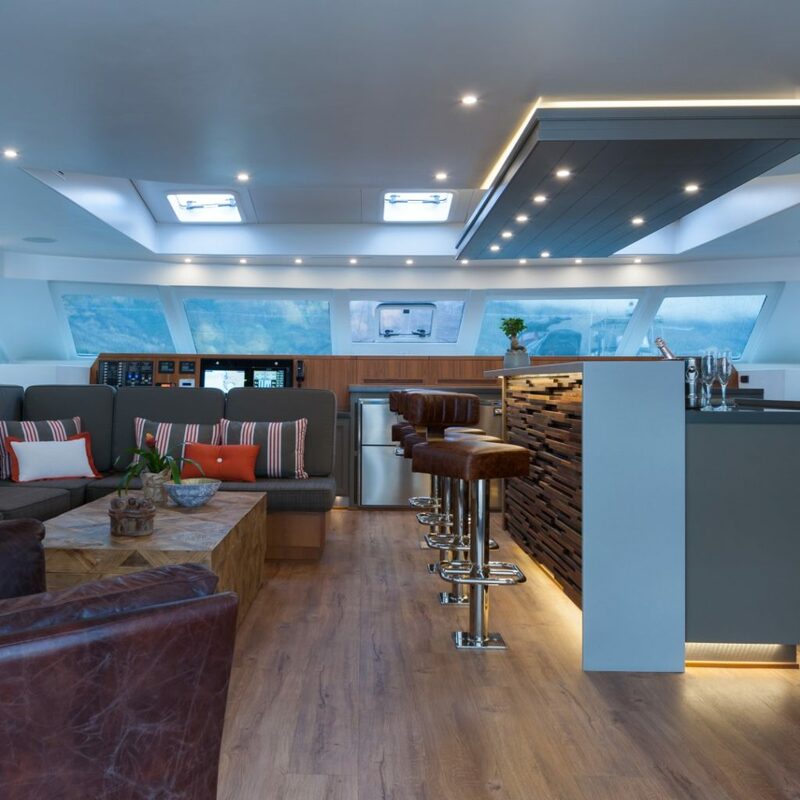 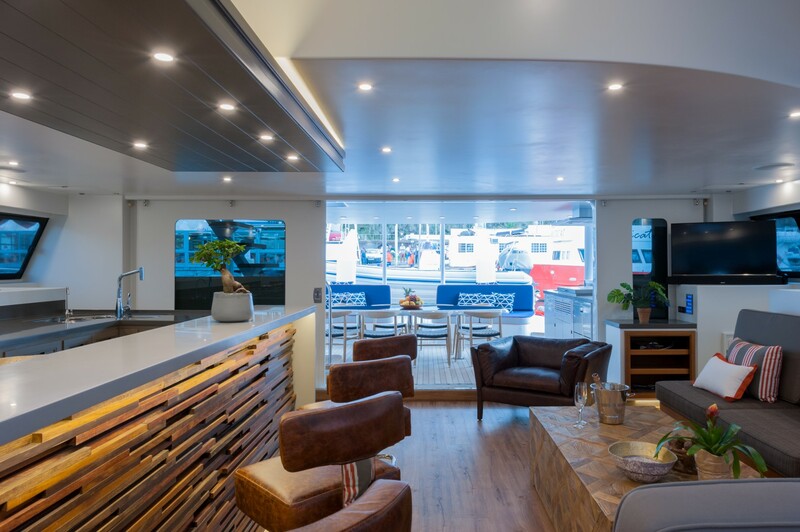 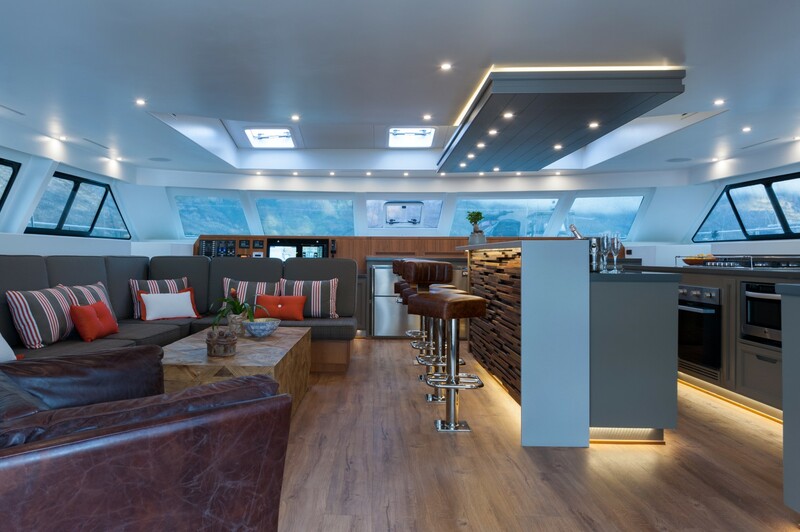 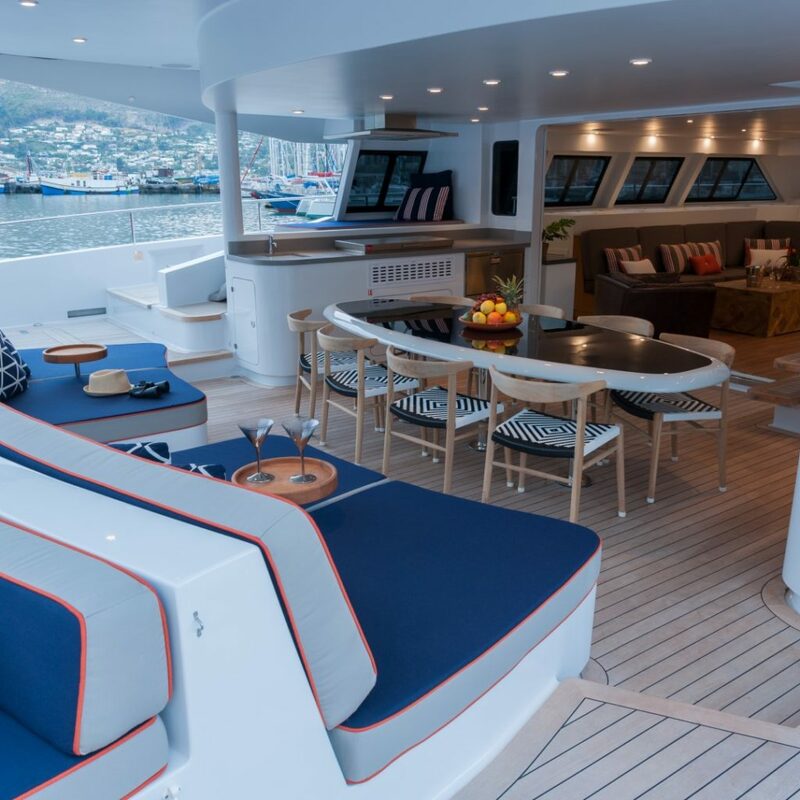 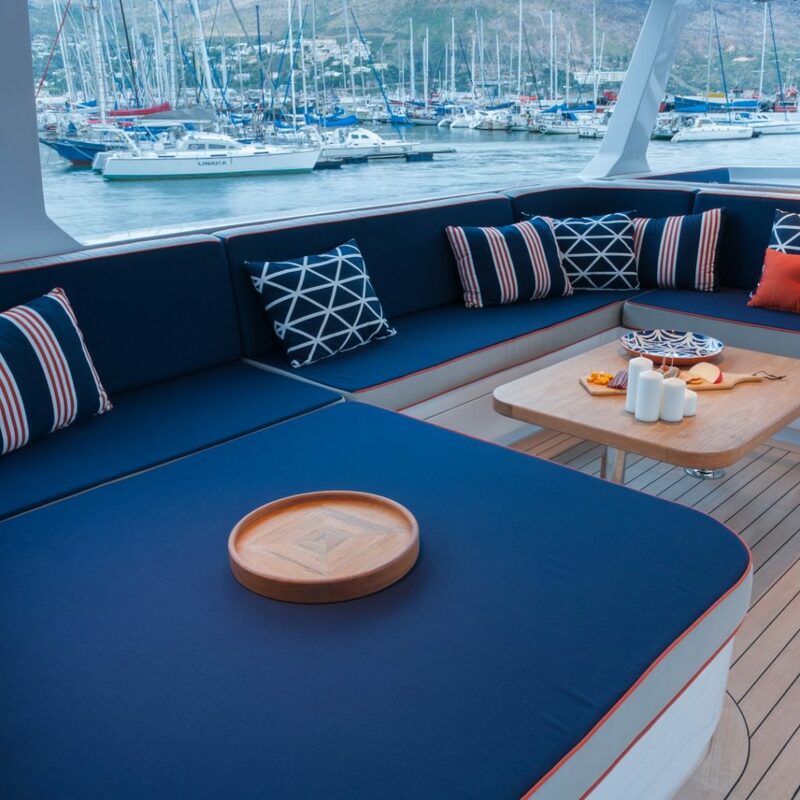 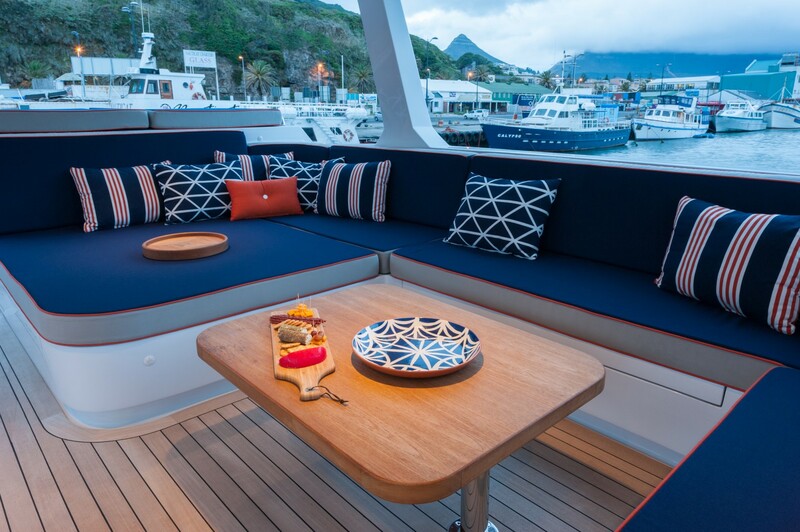 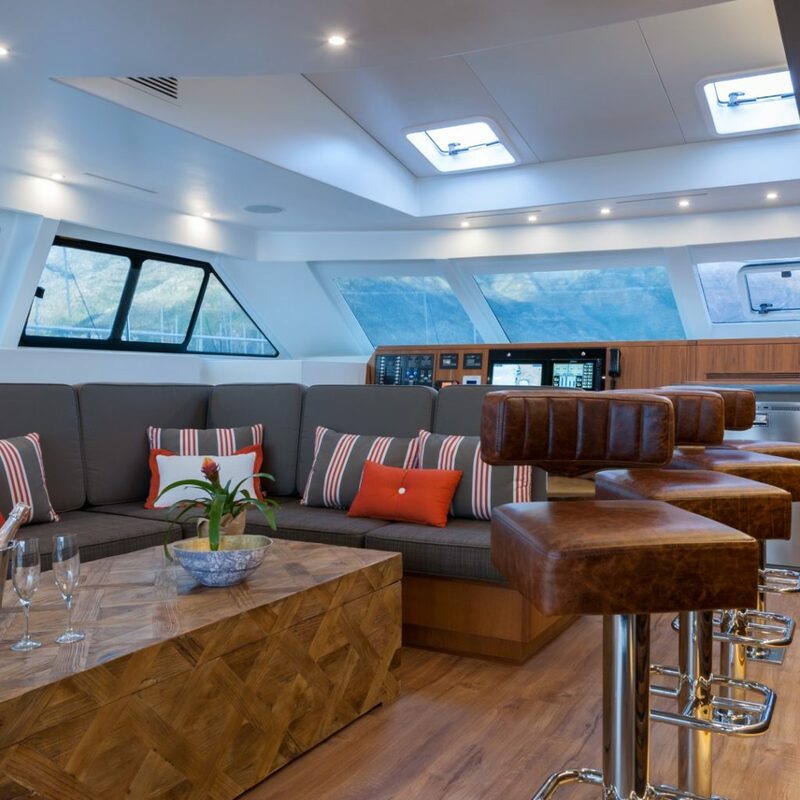 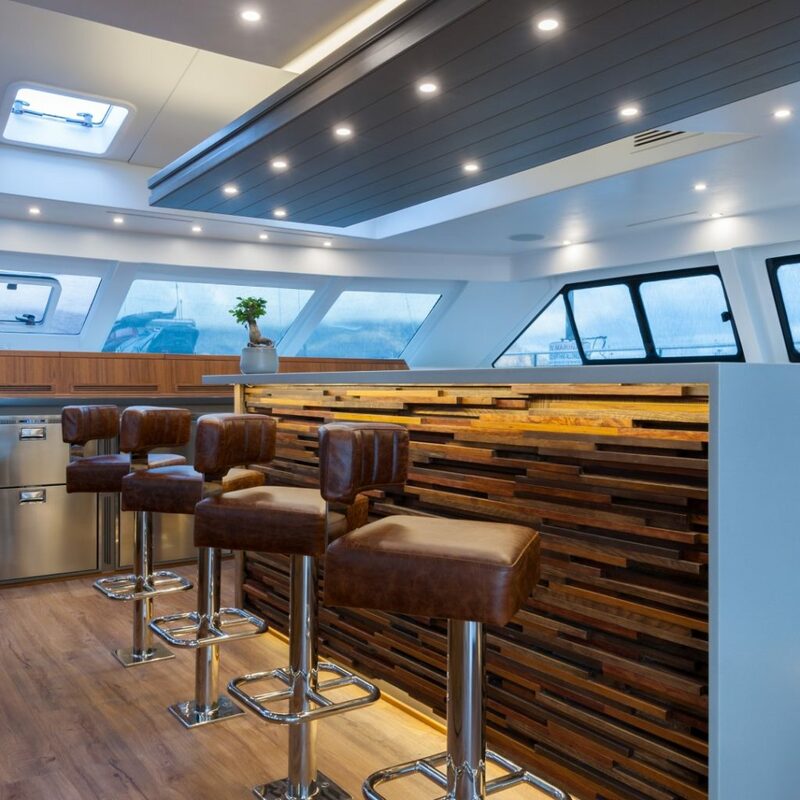 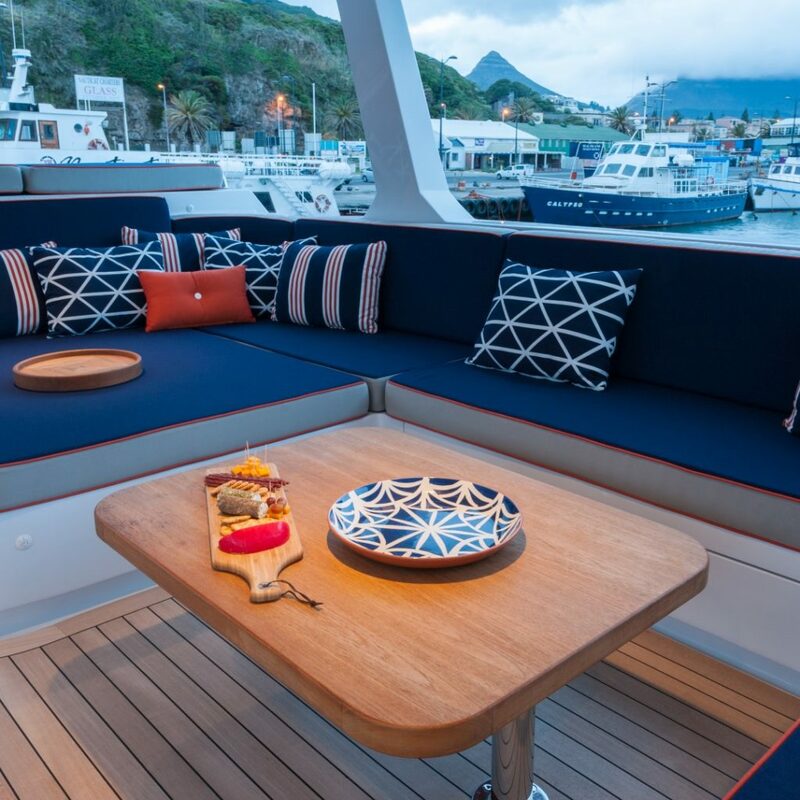 The interior layout, furniture design and finishes were done by Du Toit Yacht Design and the décor and design by designer Hanno de Swardt. 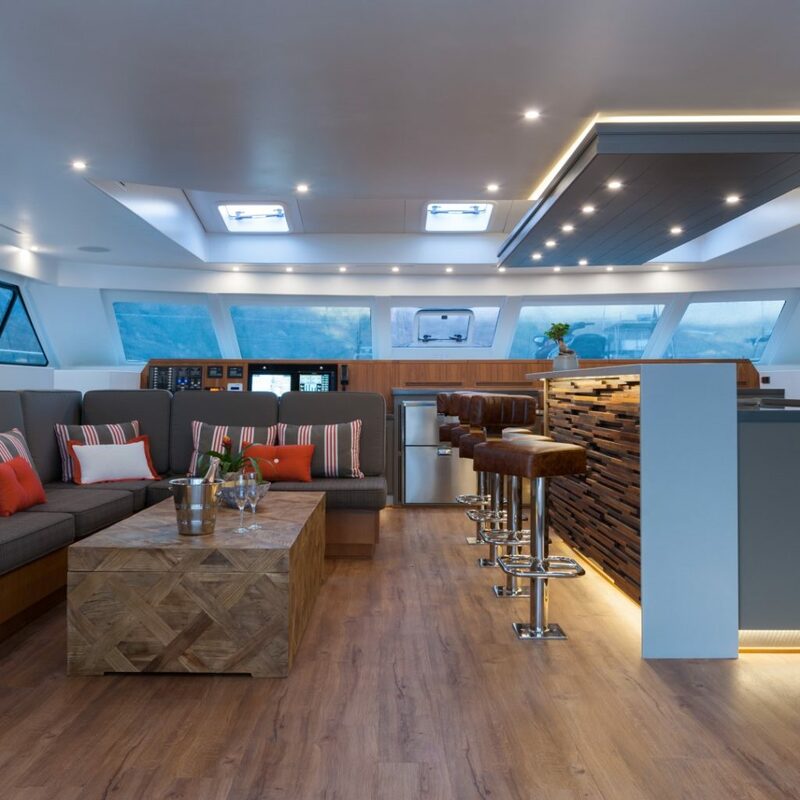 She boasts a spacious saloon and galley, with all the comforts one could ask for on a luxury holiday: air conditioning, sound system, TV and a DVD player in the saloon. 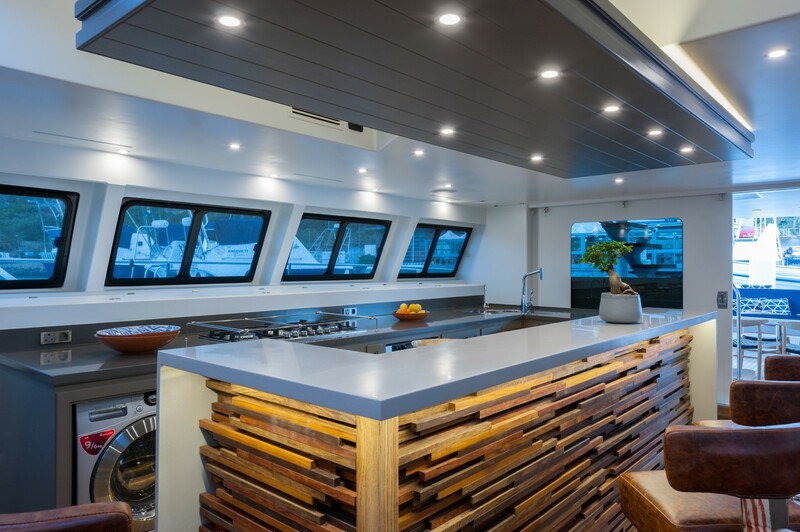 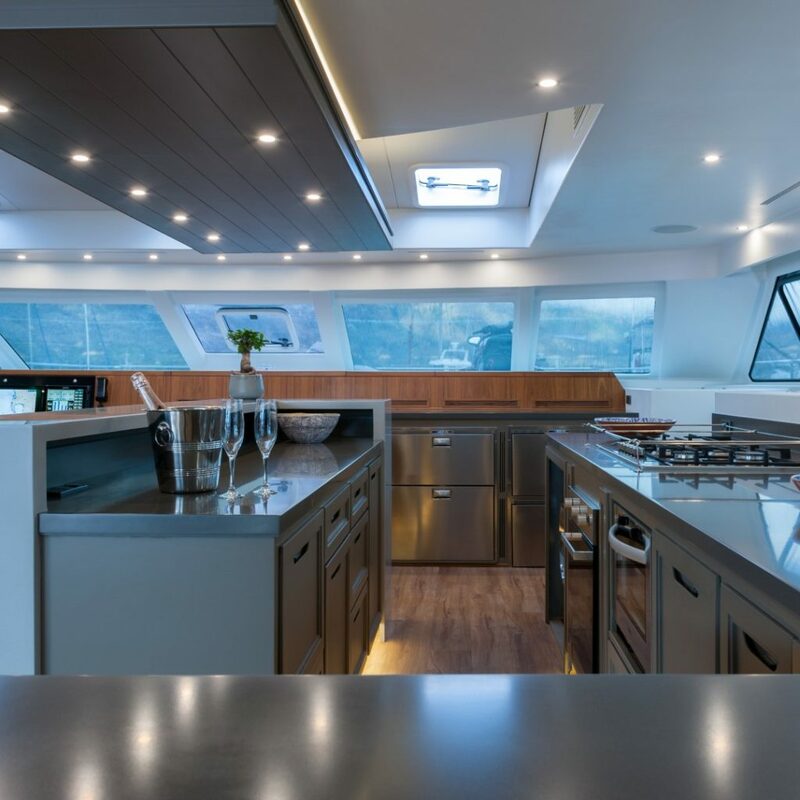 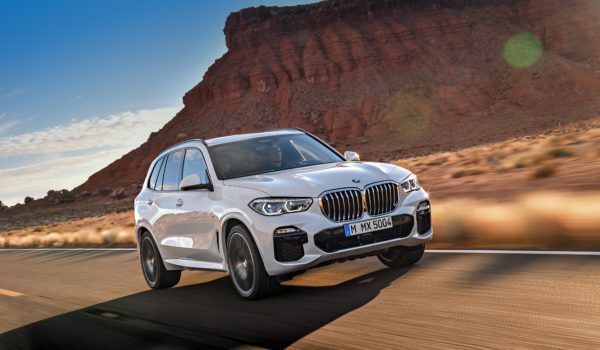 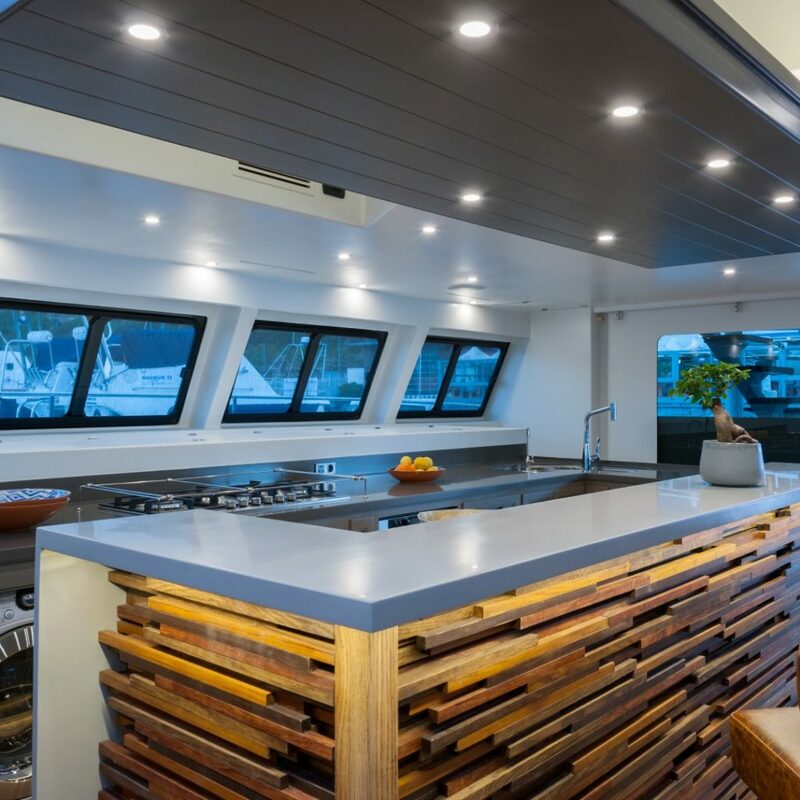 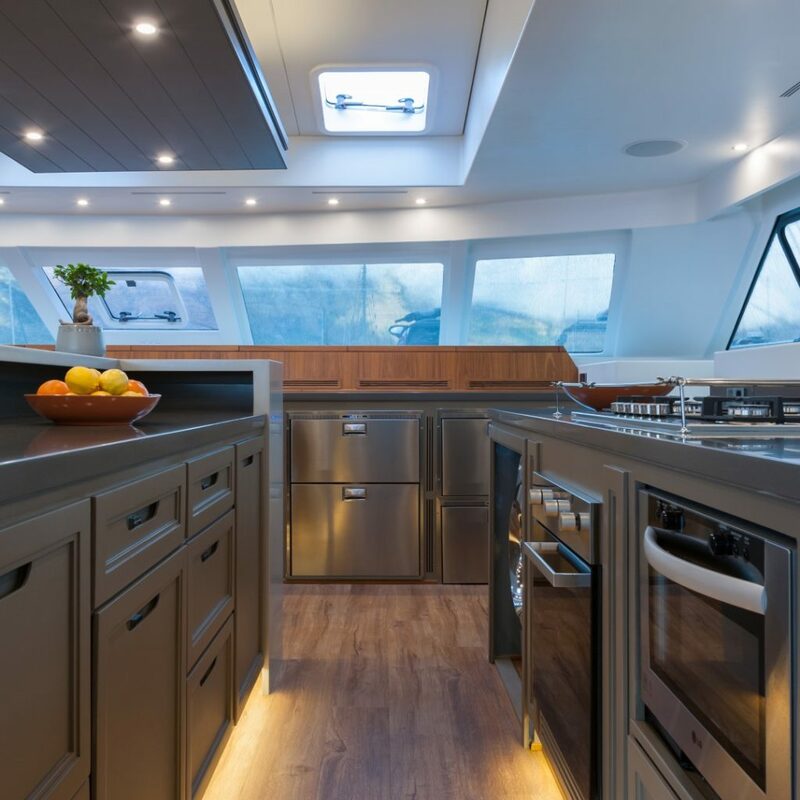 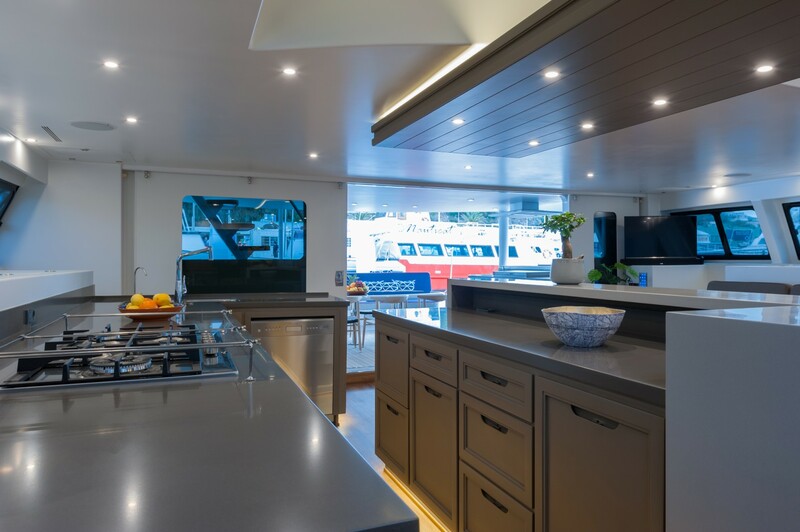 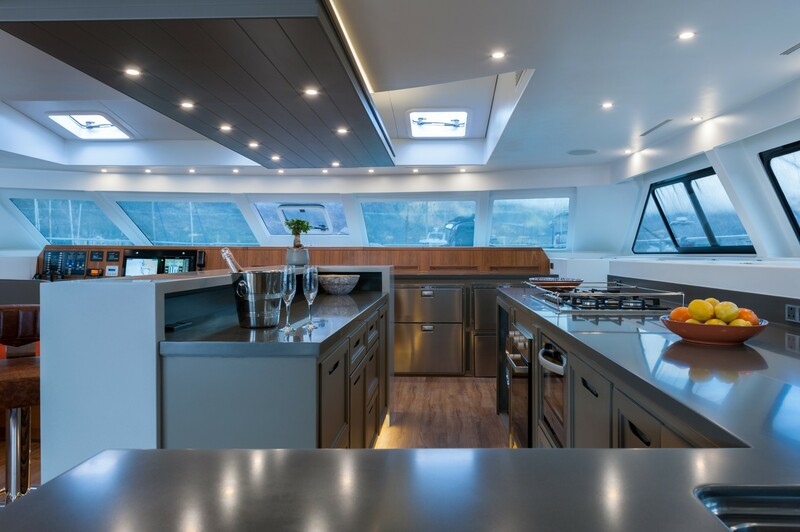 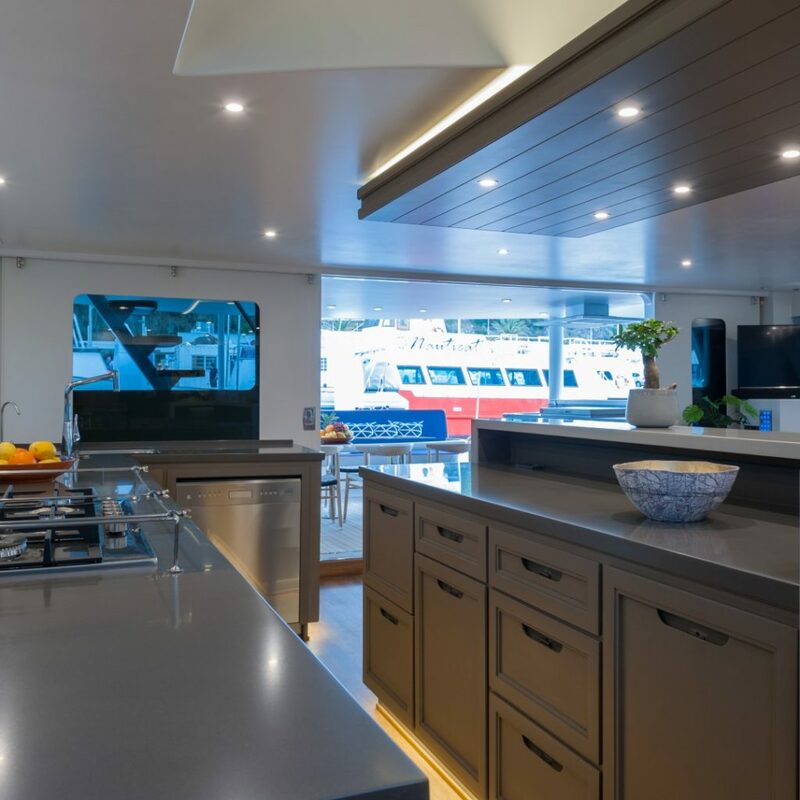 In addition there is also plenty of refrigeration and freezer space and appliances such as an ice-maker, microwave, coffee machine, dishwasher, washing machine, tumble dryer and a gas oven and hob in the galley area. 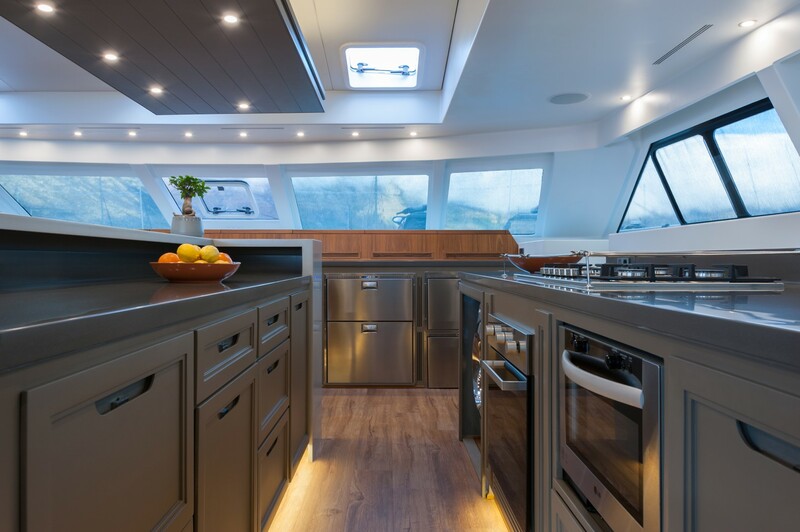 The galley forms part of the spacious main saloon area which includes a state-of-the-art navigation station. 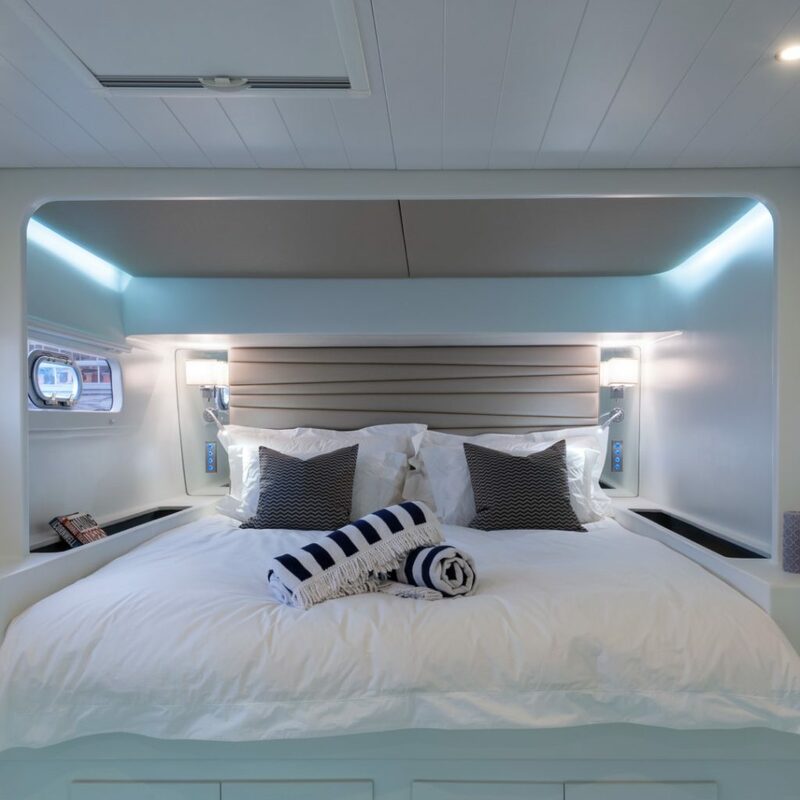 The atmosphere on the Open Ocean 800E is relaxed; guests can even join in on meal preparation, while enjoying a cold beverage after a day of fishing or playing on the water. 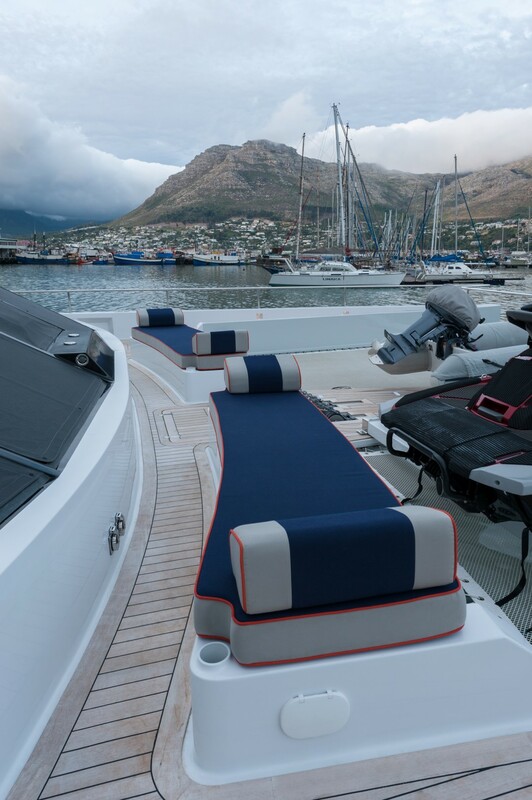 Ultra Vires has two spacious aft cockpits – one upper and one lower – both protected from the sun and the elements. 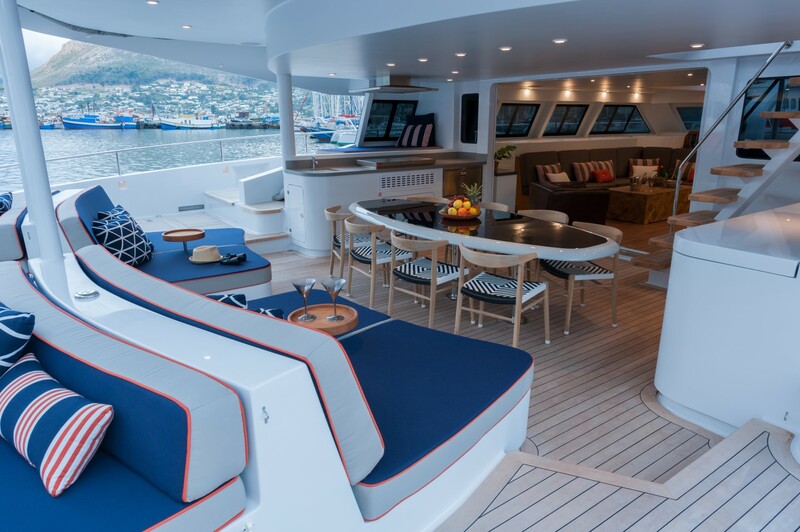 On the lower deck one will find comfortable and stylish, custom-made outdoor furniture and a bar area with a built-in braai and a fridge. 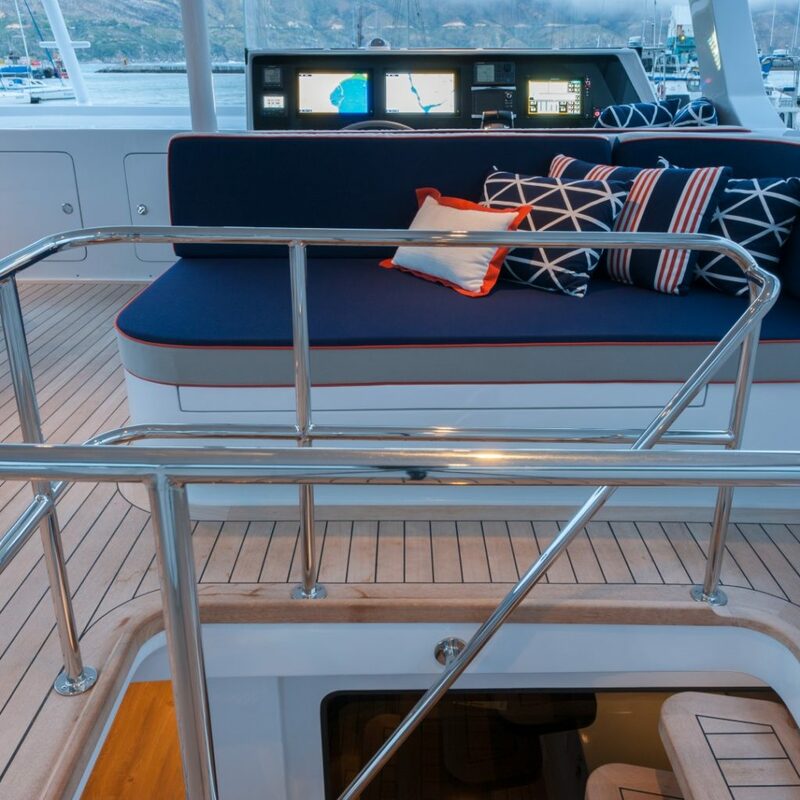 The boat is helmed from the main command centre on the upper cockpit on the flybridge and also houses comfortable custom-made outdoor loungers. 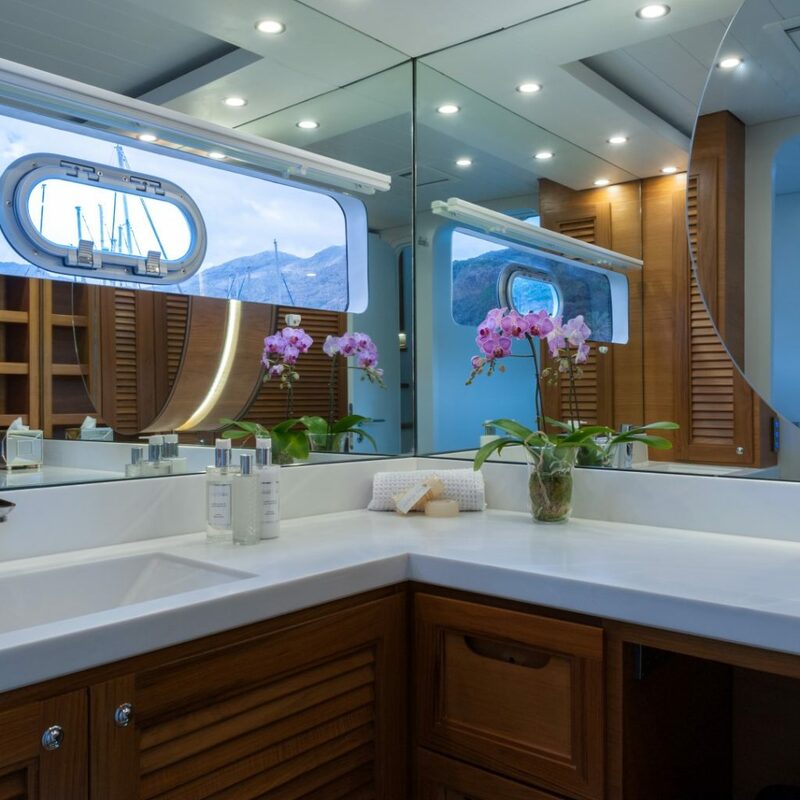 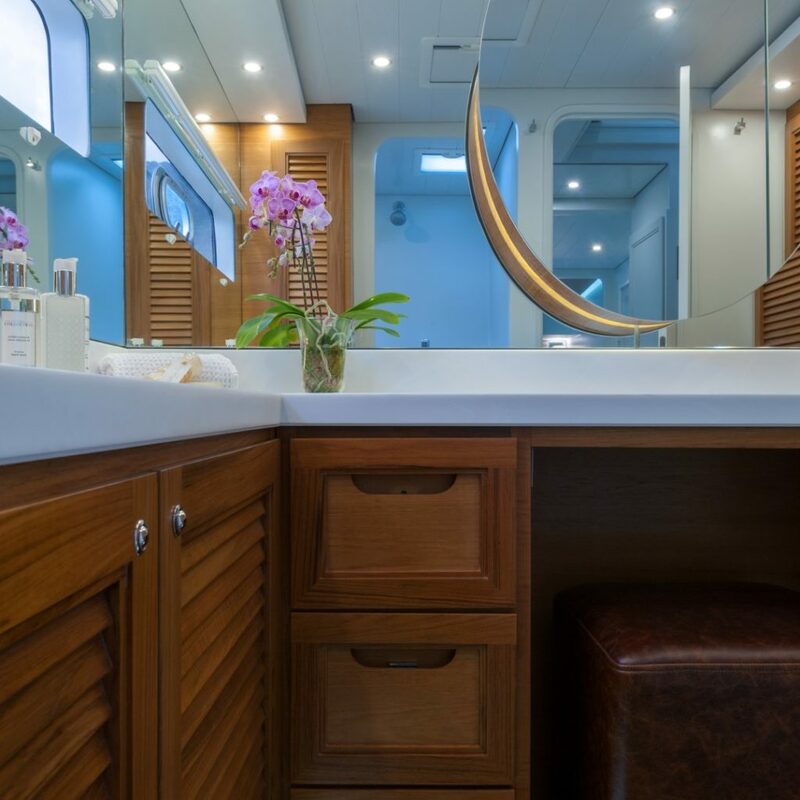 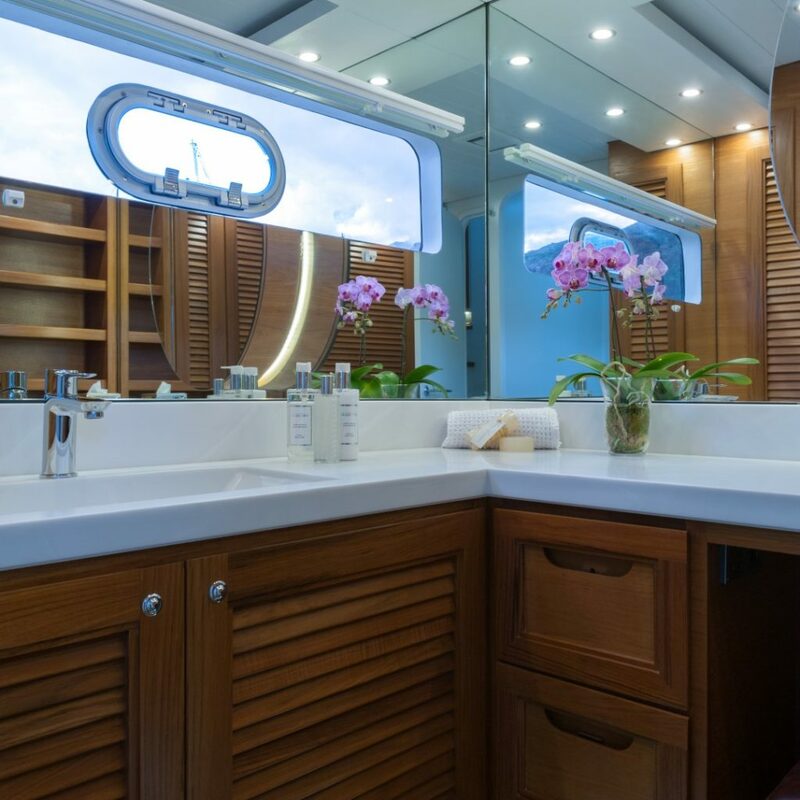 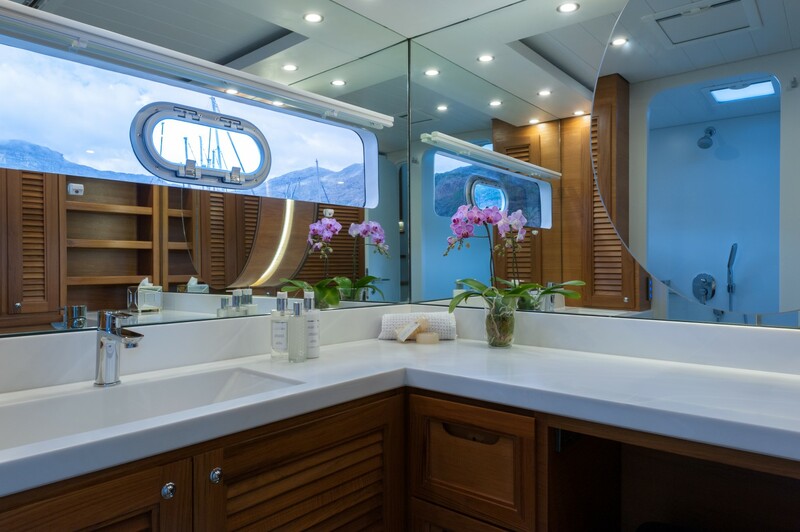 The very practical accommodation is luxurious and comfortable: Ultra Vires has two cabins in each hull, each cabin having its own entry way from the saloon and galley area and en-suite heads with a vanity and shower. 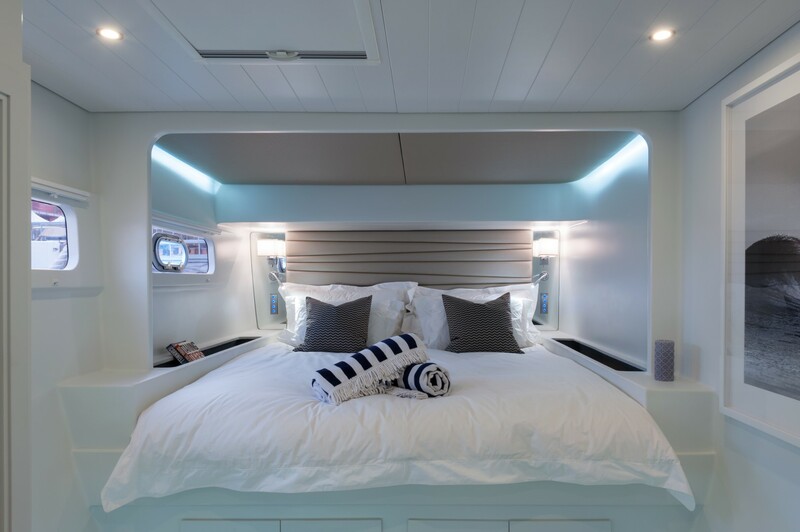 The two fore cabins on the boat can be made up as a double bed or as two single beds. 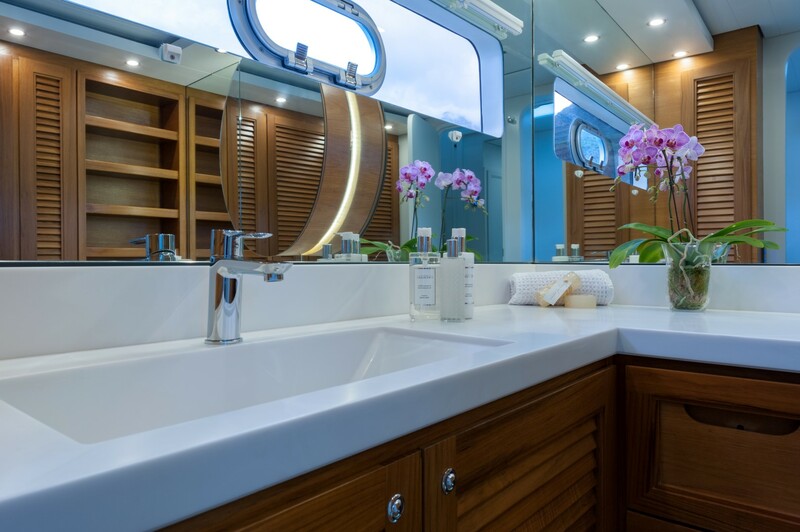 Ultra Vires has crew accommodation in each hull for two crew members; each cabin with double bunks, a heads and a shower. 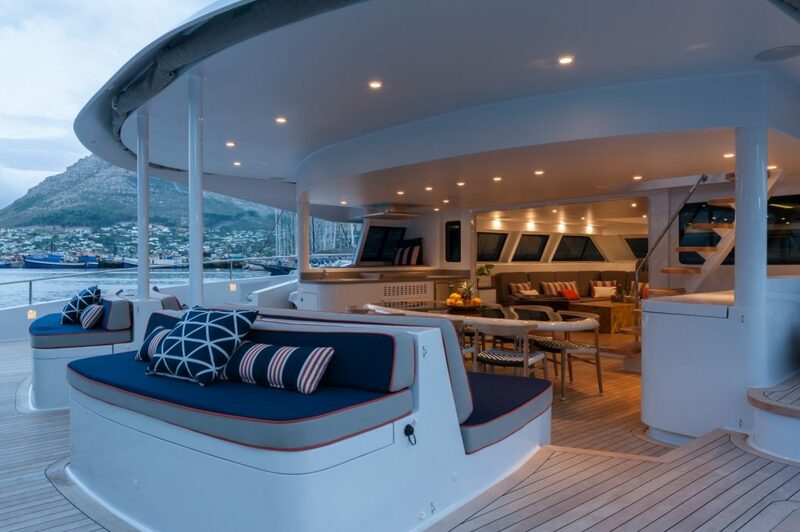 The seemingly endless decks are beautifully finished in teak and around every turn on the elegantly laid out exterior, is another toy. 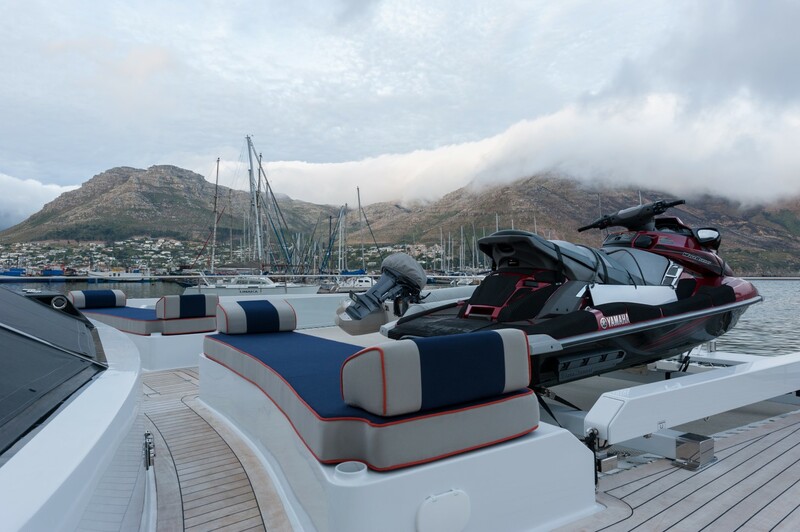 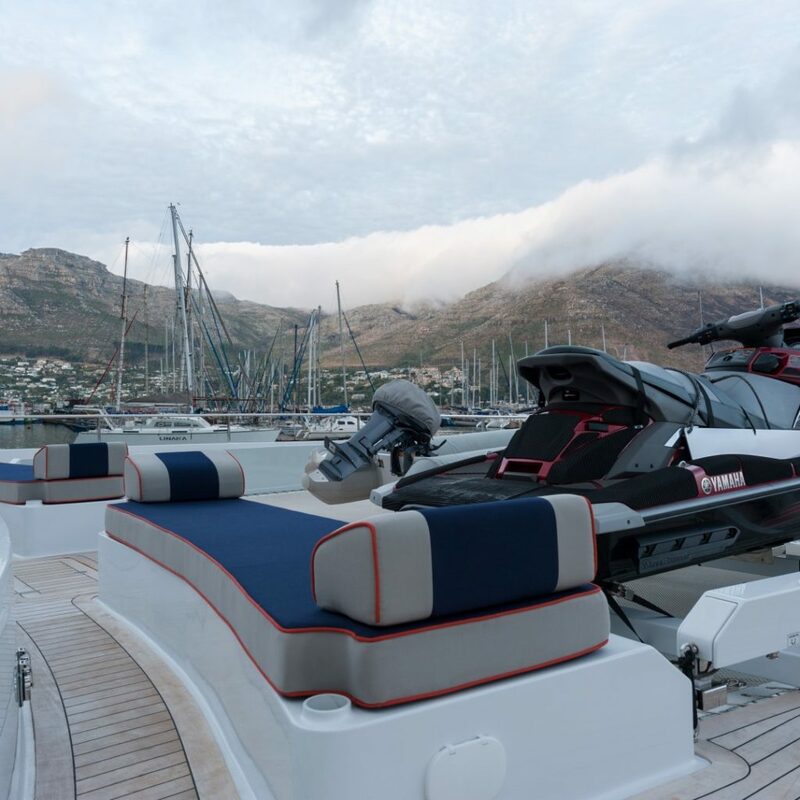 SUPs, a jetski and a smaller RIB/tender can be found on the foredeck, and a large davit which holds a 21’ RIB/tender on the aft deck. 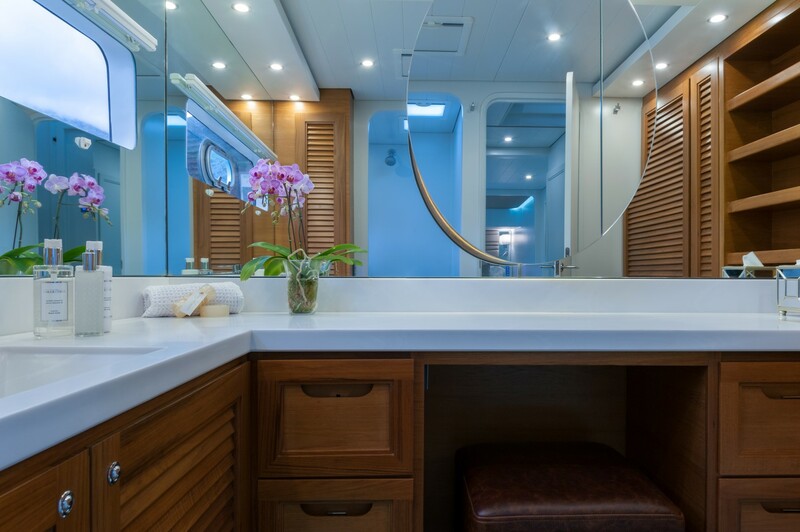 This also provides some privacy on the aft cockpit when the boat is moored stern to. 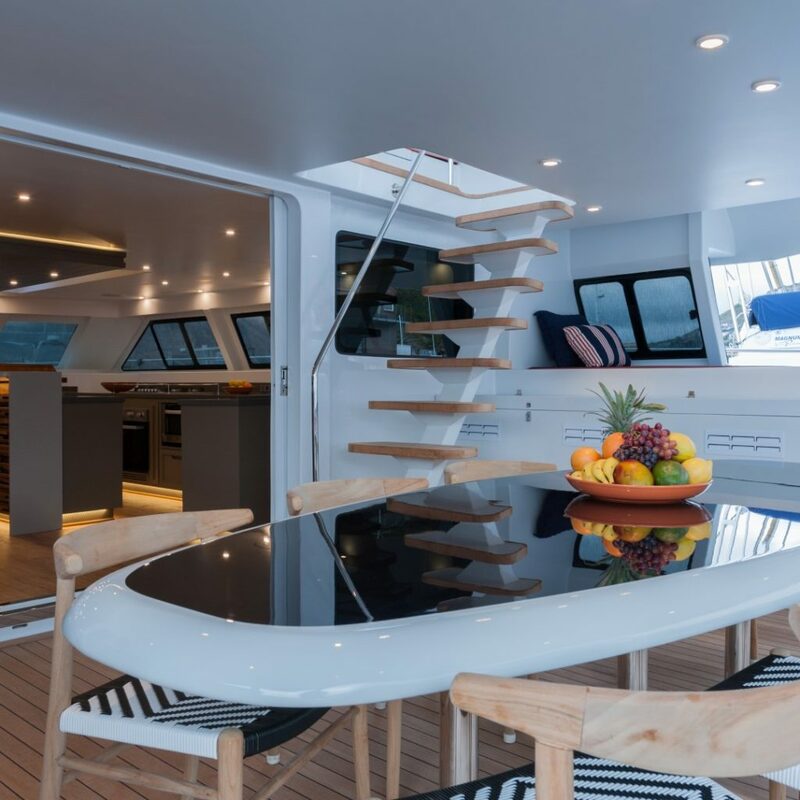 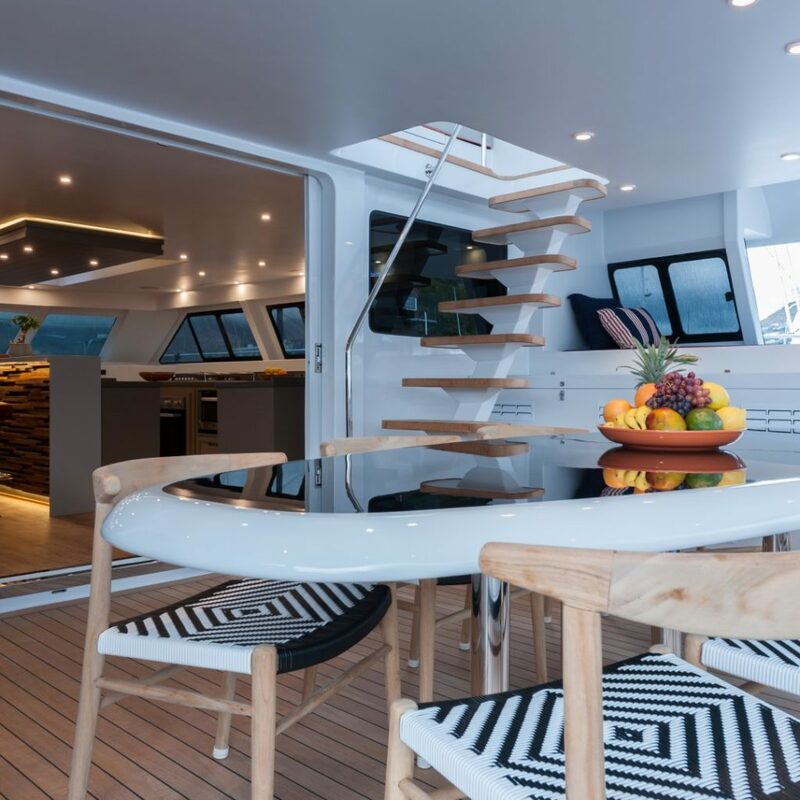 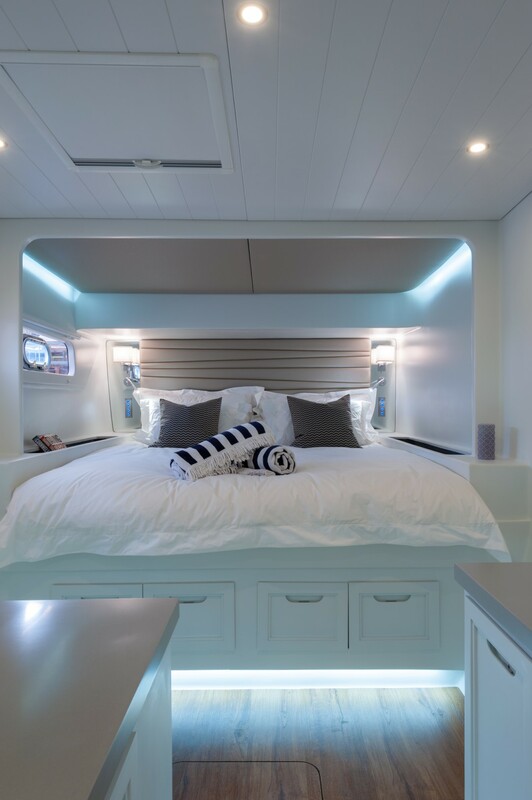 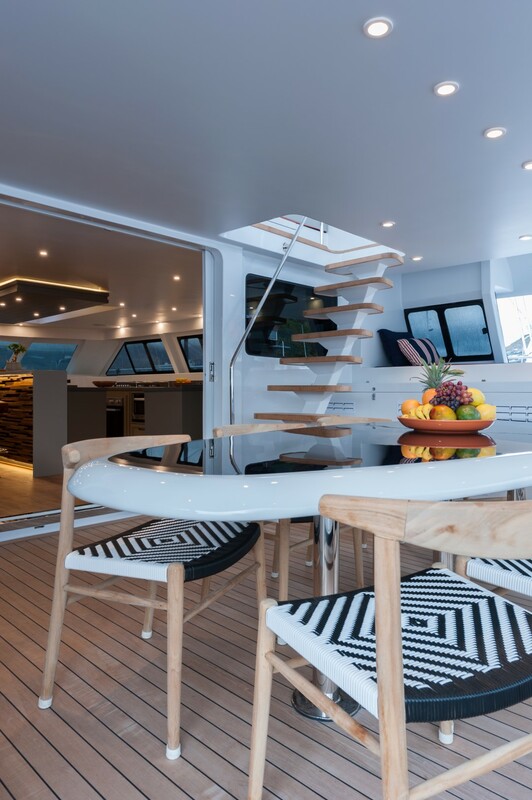 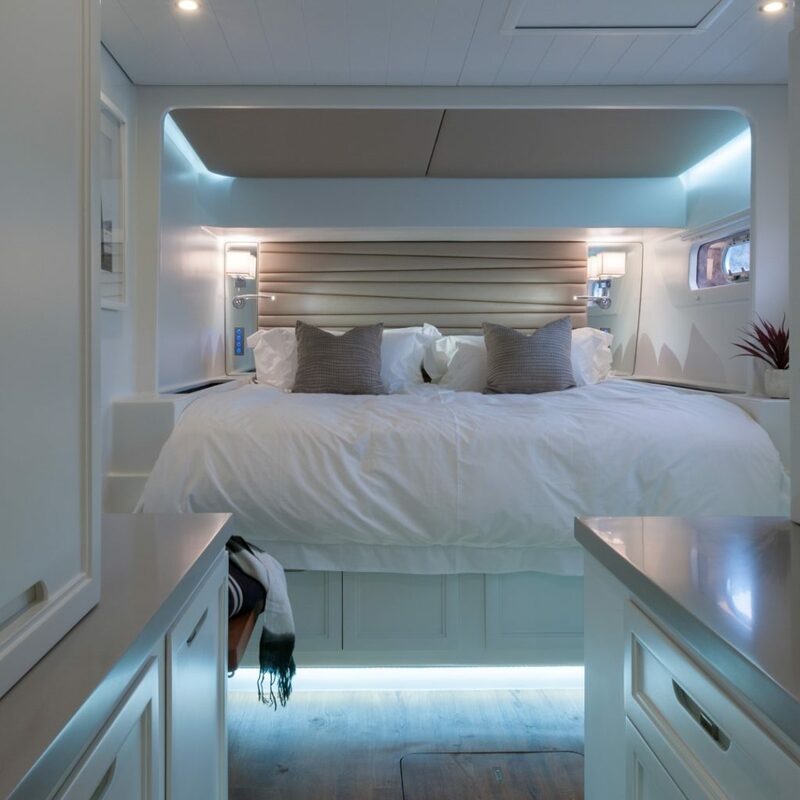 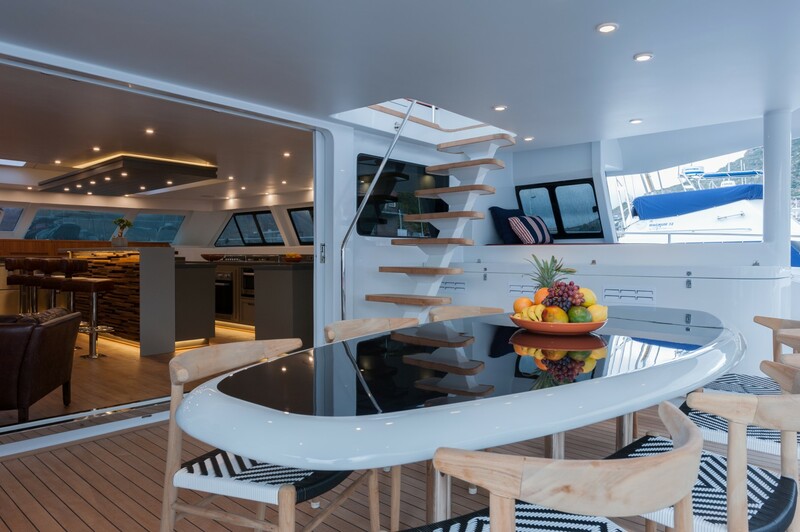 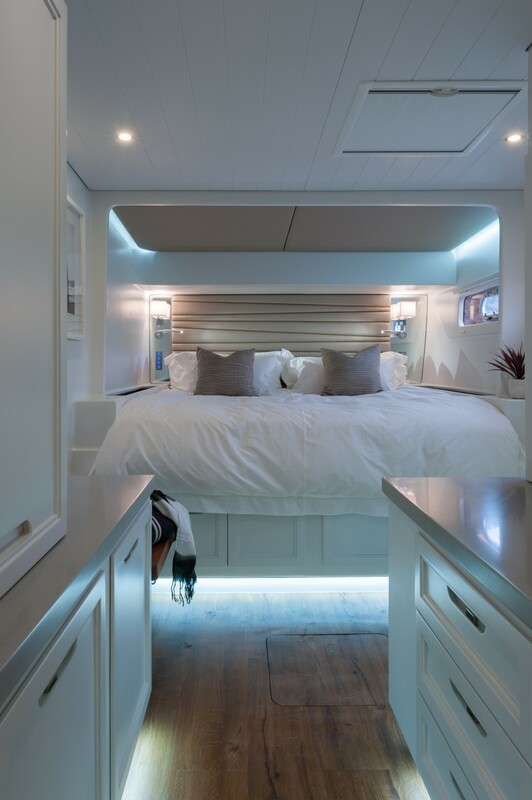 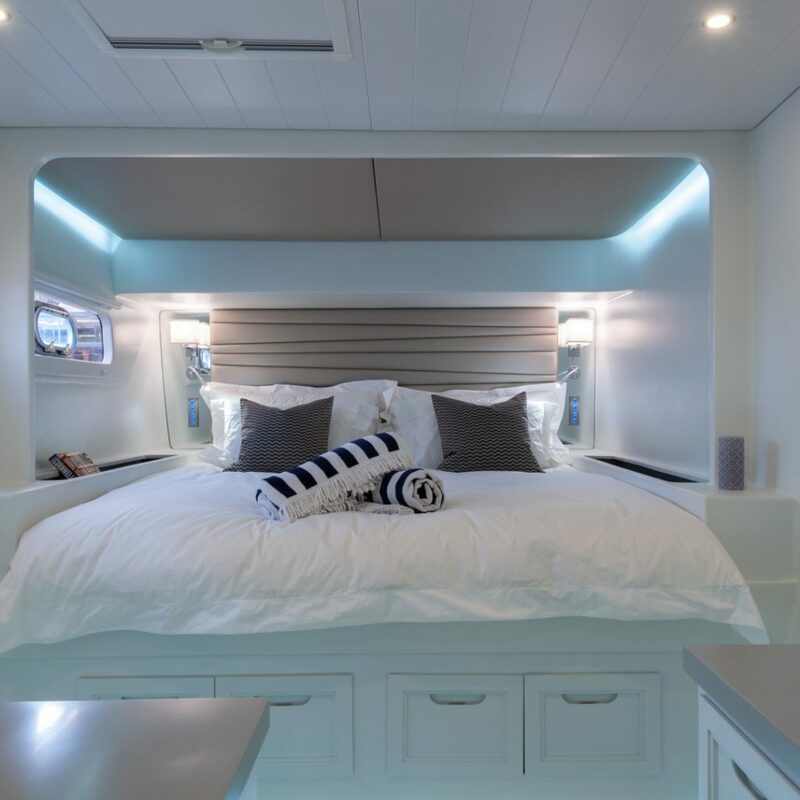 The Open Ocean 800 Luxury Expedition Catamaran is a great success due to close collaboration between the boat builder and designer, working with the owner at every step of the project, in order to create a flawless ocean-going vessel and home. 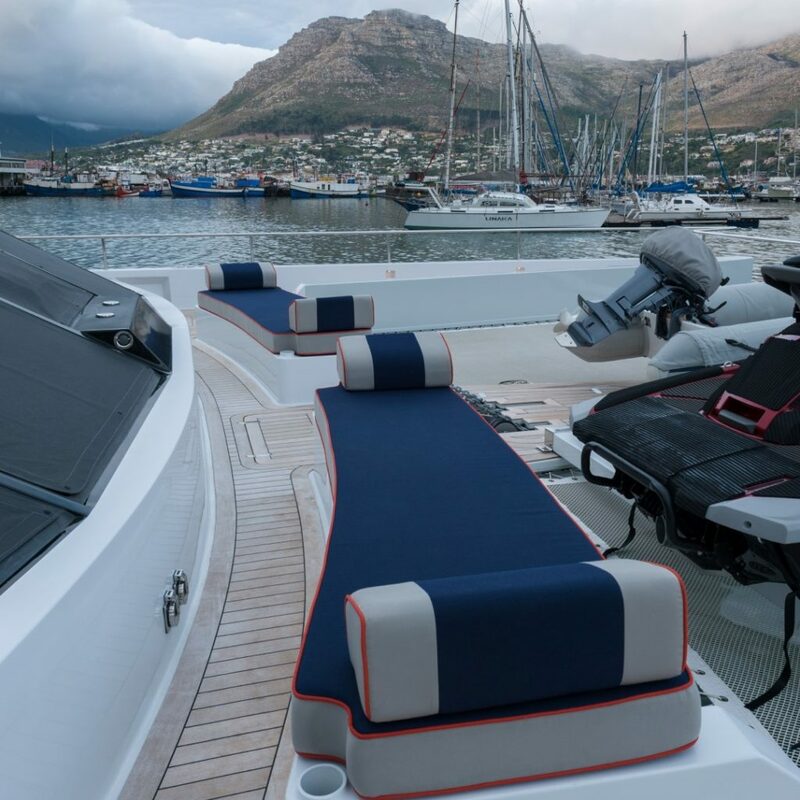 Two Oceans Marine and Du Toit Yacht Design have shown this to be true once again, with Ultra Vires being the perfect example.